The Memorial Park commemorates Hughie Edwards who was awarded the Victoria Cross (V.C.) during World War Two. Hughie Edwards joined the Australian Air Force when he was 21 and following pilot training he transferred to the Royal Air Force (RAF) in Britain under a pre-war arrangement. Another to do this was Air Vice Marshal Don Bennett, regarded as the founder of the Pathfinder Force. "It was ironic that the two most successful Australian air commanders in Europe earned their reputations as members of the RAF," noted an air force historian. In Britain Edwards was posted to a bomber squadron in 1936. Two years later he was badly injured in a plane crash and did not resume flying until the war began. In May 1941 he was appointed to command No. 105 Squadron RAF and undertook attacks on Germany, occupied countries and on enemy shipping. 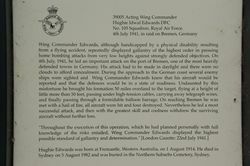 On 4 July 1941 Edwards led 12 twin-engined bombers in a low-level attack on the heavily defended port of Bremen. The aircraft had to fly under high-tension wires, through a balloon barrage, and into intense fire. All his bombers were hit, and four were shot down. For his gallantry and determination, Edwards received the Victoria Cross. Dedicated to all who served and In memory of our thousand who failed to return. Air Commodore Sir Hughie Idwall Edwards VC KCMG CB DSO OBE DFC was born on 1 August 1914 in Freemantle (sic), Western Australia. 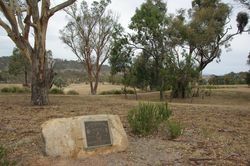 He joined the Royal Australian Air Force in July 1935 and after training at Point Cook, transferred to the Royal Air Force in August 1936. Despite having an accident which left him partially crippled he went on to have a distinguished Air Force career of 27 years serving in the United Kingdom, Malta, the Far East and Iraq. His outstanding bravery was recognised by the award of the Victoria Cross as well as the DSO and the DFC. His great leadership qualities were recognized by the air and ground crews serving with him on 139, 105 in Britain and Malta, and especially those serving with him at Binbrook on 460 Squadron. 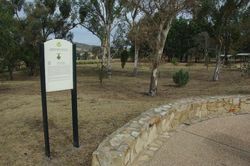 This plaque was installed by the surviving members of 460 (RAAF) Squadron on 4 December 2003.